5x8 custom printed fabric banner to fit a standard 5x8 size portable popup backdrop frame from Shows To Go Backdrops. This is a printed banner curtain only, no frame is included. Afforable 5x8 fabric banner curtain custom printed and tailored to fit a compact 5x8 format standard backdrop banner display frame. Printed using the latest high resolution dye sublimation printing technology. The fabric banner curtains are printed on Shows To Go Backdrop's theatrical display poly-blend fabric material for superior print quality and durability. Arrives ready to hang on your frame. A removable blackout liner is included. This is a banner curtain only and does not include a portable backdrop frame. 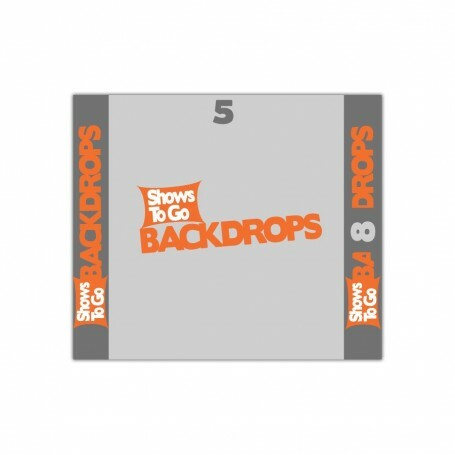 If you need a frame, you will need to purchase a complete 5x8 backdrop system that includes a printed curtain and portable frame. The ability to quickly and easily change fabric curtains on the standard backdrop frame means you can you have custom curtains for different shows and events. In just 2 minutes, you can have an entirely new background display. No need to buy a new frame to change backdrops. A flexible and professional alternative to cumbersome roll-up banner displays that use cheap vinyl or pvc that can easily crease and tear. There are no set-up fees when your artwork is submitted in a print ready format that meets our specs. Downloadable design templates and artwork specs for the 5x8 format are available from our template page. Use the artwork guidelines and templates below to make sure your art files meet our requirements. Submitting artwork that is designed for our templates will avoid delays in production (and make our production team dance with joy). Vector artwork is best, when possible. If you need artwork assistance our friendly design team is here to help. After you place your order, email our art department with the details of our design (please include any logo files, graphics, background images, etc). We will work with you to make sure your final design will look great on your product. There is no charge for basic artwork set-up. Examples of basic artwork set-up include: Adding logos to a background, formatting an image file from stock art sites like Shutterstock, or setting up a step and repeat pattern. Artwork fees may apply to designs created from scratch (ie: you don't provide any files for us to work with), custom illustrations, or files that require significant editing.